Is bad-boy caver John Ackerman saving Minnesota caves—or destroying them? JOHN ACKERMAN WAS EXPLORING a dead-end passage of an old commercial cave in southeastern Minnesota when he came to a narrow crevice through which a terrific wind was howling. For most hobby cavers, that would have been the end: They would have conceded defeat and looked for larger passages elsewhere in the cave. But not Ackerman. Instead of giving up, he bought the property and, in 1989, laid explosives around the edge of the slot. Successive blasts during the next several months allowed him to remove enough rock that he could wriggle through. What he discovered astounded him—a network of “walk-though” passages and enormous rooms, an underground labyrinth that would eventually stretch 5 miles. What thrilled Ackerman most is that he was the first to lay eyes on the place. Ackerman, it’s safe to say, has discovered more caverns than any other caver in Minnesota. The reason is attitude. Spelunking is often a passive activity. Usually, a passage happens to reveal itself at the surface through the vagaries of geology and erosion, and people explore it. But Ackerman goes out in search of caves. 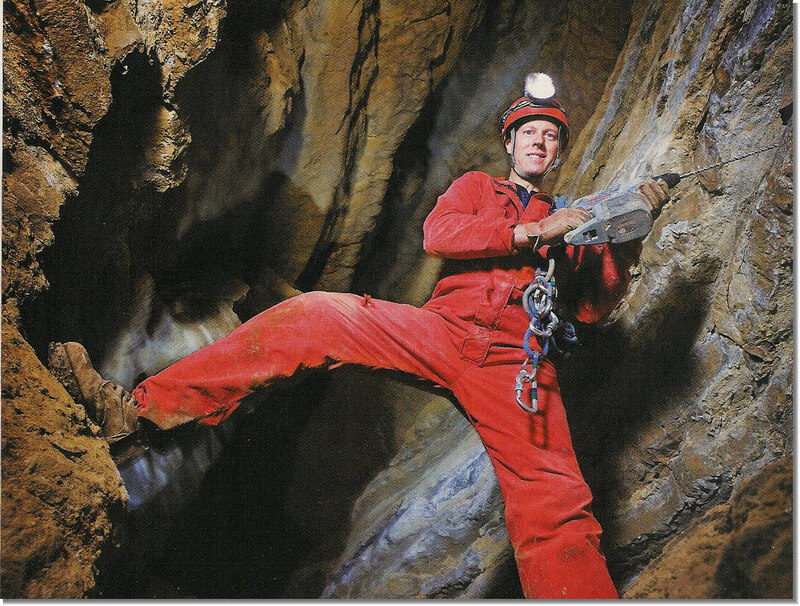 And unlike most other cavers, he has the financial resources to access caverns that others can’t touch. If a heap of rubble or a wall of rock happens to stand in his way, he simply brings in the heavy equipment, or shaves off slabs of rock with high explosives. Ackerman is building nothing less than a cave empire, buying and cutting entrances into caves he has discovered, and roughly doubling the number of caverns open to local spelunkers. In the process, he has outmaneuvered many other cave owners, including the State of Minnesota, building entrances to caves they once thought they controlled. AS A TEENAGER, Ackerman explored the artificial caverns mined from the Mississippi River bluff (“The St. Paul caves were cool because we could ride our motorcycles through them,” he says). 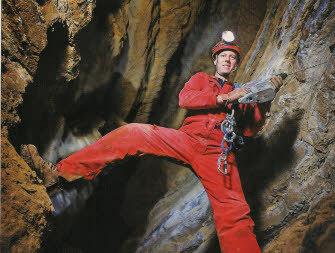 It wasn’t until the late 1980s, however, that he became an avid spelunker. Among the areas he explored was Spring Valley Cavern, a cave in southeastern Minnesota that was first discovered in 1966. Run briefly as a commercial enterprise, Spring Valley eventually went bust. In the late 1980s, though, the farmer who owned the entrance to the cave said he was interested in selling some of his land. Ackerman, who owns a successful high-end furniture repair and restoration business, decided to buy 117 acres. In Minnesota, property owners also own what’s below their land and to clamber through a cave without permission is considered trespassing, so Ackerman also negotiated with the landowner to buy the access rights to any caverns that might underlie the remaining acreage. Thus began the cave farm that Ackerman dubbed the Minnesota Cave Preserve. Ackerman’s cave farm, like much of the karst country, is situated amid rolling farmland, pocked by copses of hardwoods that farmers can’t clear or plow because sinkholes (as many as 15,000 in Minnesota alone) lie beneath the surface. By digging into the sinkholes with his “Cave Finder”—a modified backhoe—Ackerman has discovered, at latest count, 42 caves of various lengths that he has opened to spelunkers, local nature groups, and scientists at the University of Minnesota. On the day I visited the preserve, Ackerman led me down a path to an artificial limestone structure that was artfully hidden beneath the brow of a wooded hill. The building, sheltering the original entrance to the cave, provides a staging area and lockers for cavers and scientists working in the cavern, and cost Ackerman about $200,000 to construct. Dressed in coveralls, boots, gloves, and helmets with LED headlamps, we climbed down a short flight of concrete stairs to the opening of the cavern—the section where a previous landowner had hauled out dirt and gravel to improve access for commercial tours. Within about a half-hour, we squeezed through the slot Ackerman had long ago widened with explosives and entered a tight zigzagging passageway. WHEN HE BEGAN CAVING, Ackerman enjoyed exploring Mystery Cave in southeastern Minnesota. But when the Department of Natural Resources bought the cave in 1988 to add it to Forestville State Park, it locked out the cavers. “I think it was an issue of total control,” says Ackerman. “Remember, everybody was new. No one had owned a cave before.” After intense negotiations, the state opened the cave again to occasional exploration, but the dustup foreshadowed Ackerman’s later disputes with various officials over access. The first involved Coldwater Cave in northeastern Iowa. With more than 17 miles of passages, it is one of the preeminent caverns in the Midwest. Divers probing an underwater passage discovered Coldwater in 1967, and state officials drilled an easier and safer entrance, hoping to develop a commercial cave. But when further money for the project never materialized, Iowa officials handed the access rights back to the landowners, who administered entry criteria that many cavers felt were overly strict and arbitrary. A small clique of cavers won the confidence of the landowners, says the U of M’s Alexander, who still conducts research there. But others seeking entry were shut out. In 1995, Ackerman—armed with a diagram of Coldwater—bought 5 acres adjoining the disputed property and the underground rights to 200 more. He hired drillers to bore a shaft 30-inches across and 188 feet straight down into his portion of the cave. The owners of the original entrance, who in one fell swoop had lost their monopoly on access, were incensed. Indeed, what is the virtue of keeping a cave pristine and unseen? It’s not as if caves, unlike wilderness areas or wetlands, are in short supply. There are hundreds or thousands underlying the Midwestern karst. Only a fraction of those are open to the public, however. Late one summer day, Ackerman and I drove to Tyson Spring Cave in Fillmore County. Cavers have known about parts of Tyson Spring for more than a century, but it wasn’t until 1985 that divers were able to swim through two underwater passages that had blocked further exploration. Ackerman was one of those early surveyors, and after purchasing rights to the cave, he—once again—punched through a new entrance. After descending more than a hundred steps into blackness and cold, we alighted at the edge of a tumbling, swift, burbling stream. We clambered over boulders and rapids and waded through pools to our waist, marveling at multi-colored fins and ribbons and entire walls of flowstone. A quarter-mile into the cave, we came to a big chamber and sat down to take in the scene. Greg Breining is a frequent contributor to Minnesota Monthly.